I make this easy beer pizza dough in the bread machine on the dough setting. I've included some instructions for the stand mixer below the recipe. 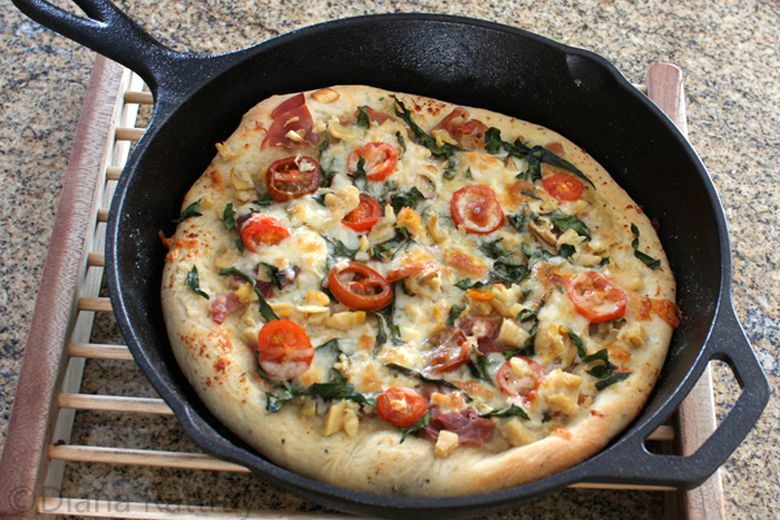 Top the pizza with your favorite store-bought or homemade pizza sauce, toppings, and cheese. Put all ingredients in the bread machine pan in the order recommended by your bread machine manufacturer. Set it on the dough cycle. When the cycle ends, remove and roll out to fit your lightly greased pizza pan(s). Cover with a towel and let rise in a warm place for about 20 minutes longer. Top with your choice of sauce, toppings, and cheese. Bake in a preheated 425° oven for about 15 to 20 minutes, depending on the thickness of the crust and the toppings. Makes enough dough for a 14- to 16-inch pizza, two 10-inch pizzas, or two thin crust 12-inch pizzas. To make the dough with your stand mixer and dough hook or by hand, mix and knead for about 10 minutes then let it rise for about 30 minutes to an hour, or until doubled. Remove it and roll it to fit your pizza pan and proceed with the recipe. Use the dough to make pizza pockets or calzones. Beer and Basil Pizza Dough - Add about 1 1/2 teaspoons of dried leaf basil along with the flour.